Model : Rattalin Rap RNR05. Maker : Rapala. Type : Sinking. Sound : Rattle. Here at HotSpotTackle, we are all nice people and we in turn hope that all the anglers out there are nice people as well. We work with common sense, which is getting very rare in the world now. Rapala lures do catch fish! Trending at C $8.81eBay determines this price through a machine-learned model of the product's sale prices within the last 90 days. Model : Rattalin Rap RNR05. Maker : Rapala. Type : Sinking. Sound : Rattle. Here at Shimreels, we are all nice people and we in turn hope that all the anglers out there are nice people as well. We work with common sense, which is getting very rare in the world now. Special "tuned" sound chamber is loaded with rattlin' BBs. Cast out aRattlin' Rapala and watch the swimming action at slow to very fast retrieve rates — you'll be amazed. Sound heightens curiosity in fish and triggers investigation. Trending at C $6.98eBay determines this price through a machine-learned model of the product's sale prices within the last 90 days. This is a lot of 1 Rapala "Rattlin' Rapala" lure. 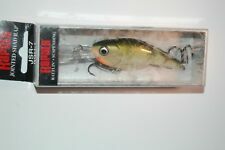 The lure is 2" long and weighs 3/8 oz. The lure has a variable prof.nage. Sound heightens curiosity in fish and triggers investigation. These lures actually have sound frequencies that are harmonic, uniform and "in tune" with nature. This secret of sound combined with the legendary Rapala® "wobble" is what make this lure so effective.